A drink-driver who drove the wrong way down a dual carriageway with two flat tyres has been jailed for 16 months. Officers rammed Remigijus Katinas' car to force him to stop during the incident on Boxing Day on the A14 near Stowmarket, Suffolk. The Lithuanian was so drunk he could barely walk, Ipswich Crown Court heard. It was "a miracle" no-one was killed or seriously injured, Judge John Devaux said. Father-of-three Katinas was travelling at 80mph (128 km/h) when he nearly crashed into several other cars at 00:20 GMT. One of the drivers was Det Insp Jim Gooding of Suffolk Police, who was on duty in an unmarked police car. He managed to swerve out of the way but called the incident a "very near miss" that left him shaken. 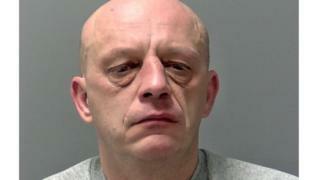 Katinas, 47, from Thetford, Norfolk, was driving his Volvo S40 with full headlights on, the court heard. He had been travelling in the wrong direction for several miles, after leaving a pub in Little Stonham. Officers waited for him in a lay-by and flashed their headlights as he approached, but realised they would have to perform a "tactical stop" using their car as a barrier, Richard Kelly, prosecuting, said. "It soon became clear he was so intoxicated he couldn't support his body weight so they had to assist him out of the car," Mr Kelly said. They noticed Katinas had two flat tyres which he said were damaged when he left the pub and hit a fence, shortly after he had an argument with his partner on the phone. He refused to give a breath test but was more than three-times the legal limit five hours later . Katinas admitted dangerous driving and failing to give a breath test at an earlier hearing. He had no previous convictions and the court heard he was genuinely sorry. Judge Devaux said the incident was out of character but Katinas had "no regard for the safety of others" and was so drunk he "could not walk unaided". He sentenced him to 16 months in prison for dangerous driving and disqualified him from driving for two years and eight months. Katinas was also fined £300 for failing to provide a specimen and will have to take an extended new driving test. The judge commended the officers who stopped Katinas' car, saying they "endangered their own safety".